It’s the time of year when nature gets by with little sleep, choosing instead to party late and rise early just to do it again. To try to keep up with her, even for a moment, is beyond us. 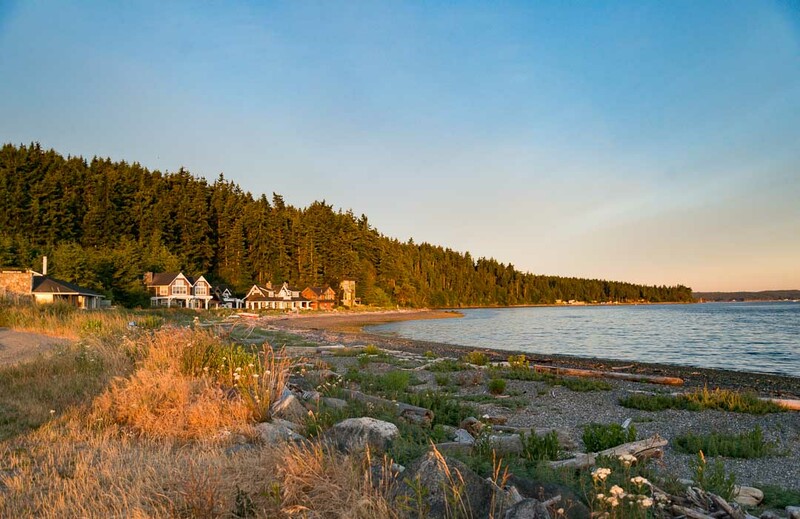 Long Point on Whidbey Island is one of those places to see the entire day unfold. 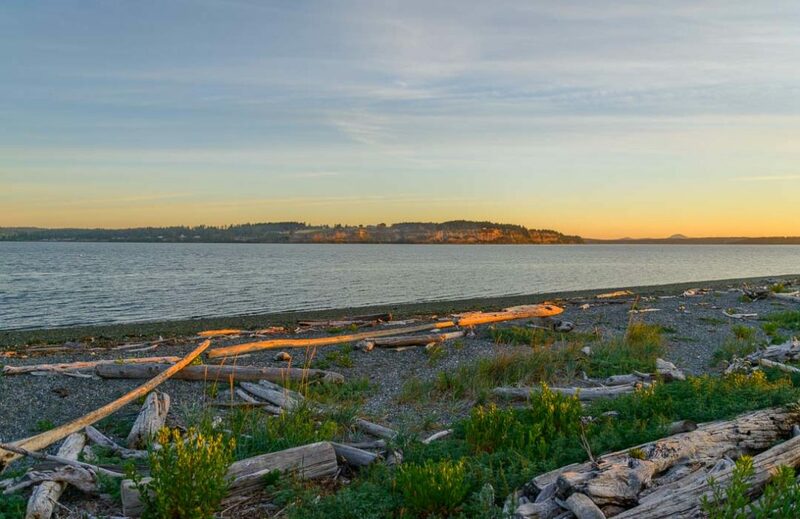 The southeastern tip of Penn Cove is like most northwest beaches, smooth rocks and driftwood, a place where earth and salt water bump and wear at each other. A small strip of public land with beach access is tucked among the waterside homes. I chose to visit it on the longest day of the year, the first day of summer. Take SR 20 north to Parker Road (just north of the Navy’s Outlying Field). Travel one mile, then right on Portal Place and then left on Marine Drive. Drive about half-a-mile to Long Point. Summer is full of plenty here. Farms summer attire features green lawns that will soon be lettuce or squash. The first mowing of hay is over, and great blocks of it are bundled in the field. Deer seem to be everywhere, and if you haven’t seen an eagle today, you were obviously not looking. But the plenty today, as it has been for a couple of months and will be for several more, is sunlight. Sometimes the yellow-gold of morning, or the reddish-gold of afternoon and sometimes filtered through fog or partially impeded by a storm, it’s there. I arrived too late to see the garish red clouds that marked the pre-dawn, the day’s transition that is a photographer’s delight. But the view would not be missed. More than 180 degrees of water view: a front-row seat for dawn, dusk, and everything in between. I picked my way through the driftwood and down to the water’s edge. Low tide exposed shell fragments and a gentle breeze created small waves that lapped against the beach, creating the moment’s only sound. This wasn’t the Penn Cove view that has become an icon. The historic wharf that dominates most images was a distant point of red. This beach access is quite simple with the only amenity being a place for a few cars to park. I imagined that as the day wore on that families with young children might come out here, exploring the area and connecting with each other. I promised myself to return here for Race Week, the annual July sailing regatta. The point of land might be close to the action. The sun pierced the horizon; homes and trees were washed in morning light, grays into greens, reds, and blues. The day had started, and sunlight would wash this part of Penn Cove for the next 16 hours, rest a bit, and then do it again. This is a public spot in the middle of a neighborhood. Please be respectful of property rights and enjoy the area in a way that makes it a joy for the neighbors to share their view.